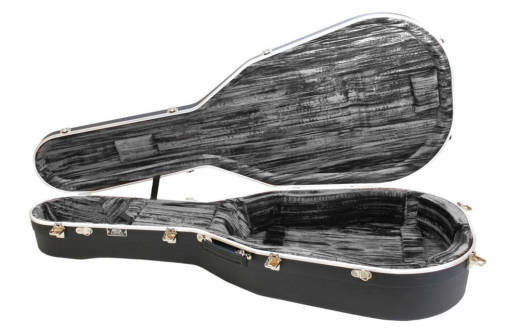 The Hiscox Artist Dreadnought guitar case is suitable for 90% of all Dreadnought or Folk size guitars. The construction consists of a moulded, high impact resistant A.B.S. plastic outer shell. This is bonded directly to an inner moulding manufactured from a unique blend of 'High Tech' cellular foam. The inner moulding is feather light and, being semi-rigid, is designed to soak up impact shocks from the outside world. The unique bonding of the inner moulding to the outer shell gives unbeatable, total structural rigidity.